Why the heck would I make this? What is it exactly? How did I make it? First, I noticed when driving down the road that only when the subconscious alerts us, do we take notice of something in front of us. For example, on a two lane road, many cars pass in the opposite direction, but only when a black and white unit goes by, do take notice. I guess the fear of getting a ticket is embedded in all of us. Similarly, when a human figure is near the edge of the road, we take notice to insure no one runs out in front of us. Second, our TV news casts (and newspapers) are no longer news oriented but more of local entertainment channels. (That’s what we want to see) So whenever ANY new Bigfoot story arises throughout the world; yes, it’s our ‘lead in story’ on the 11 o’clock news. 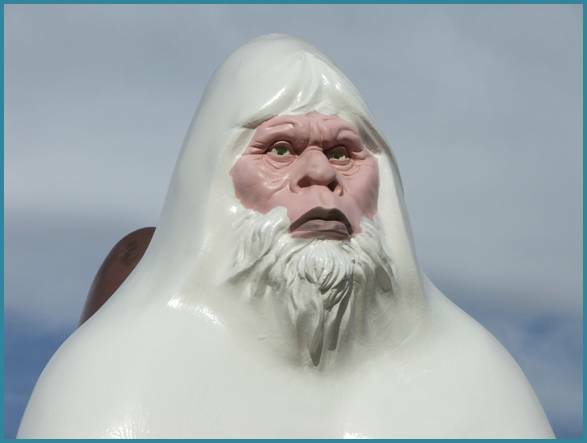 There’s an awful lot of us closet Bigfoot followers. So yes, I combined these two phenomenons together and now I am producing the Roadside Monster. Part of my background is a hobbyist car buff. I produced fiberglass car parts for myself and others. I learned how to make plugs, molds and car parts. I enjoy it. I also have a slight artistic side, and enjoy creating ‘something’. And last, I’ve also always enjoyed a good laugh. So heck, I put together a couple of wooden scale models, finally got a rough shape I liked, and started. 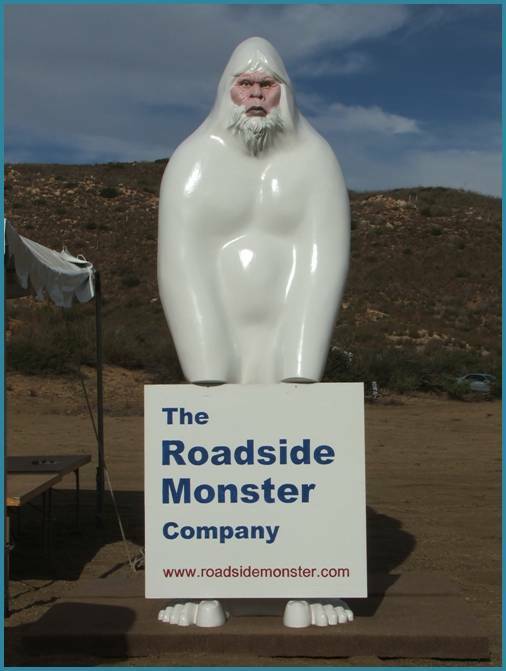 The Roadside Monster is basically a fiberglass statue with optional equipment. 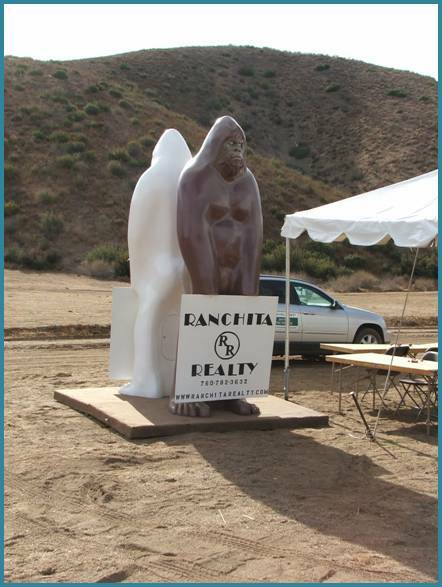 It is my interpretation of what the silhouette of Bigfoot (yeti, Sasquatch) would look like. It’s designed to hold a simple sign in front which is small enough to not disturb the silhouette, but large enough to be read when someone approached within 50 feet. The monster is not detailed because it’s the basic silhouette I was trying to create. 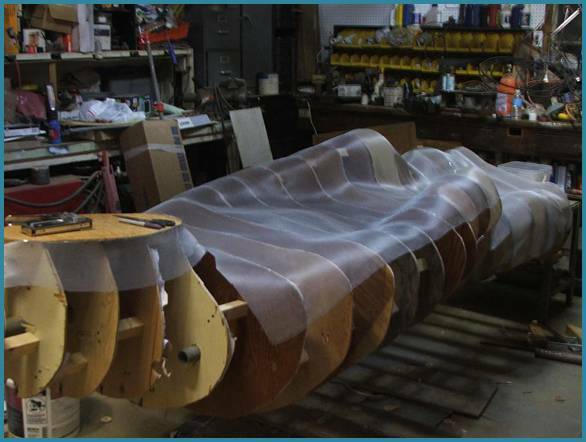 Fine detailing would simply create fiberglass mold release problems which I really did not want to deal with. Gaps between the arms and body would mean difficult multi-sections that would not add to the functionality to the basic reasoning behind the creation. The basic shape from a distance is all I was looking for. It had to be large enough to stand out at 200 to 300 yards. If I got it too detailed, then it would end up as the centerpiece in some fraternity house. The design also had to facilitate filling the bottom of it with enough rocks, cement or anchorage to prevent it from either blowing over or walking away. But, to help in ‘bringing the people in”, the Roadside Monster has different optional faces that can be put on it. 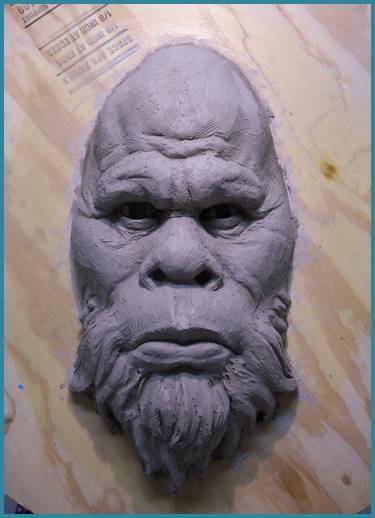 A scary face, a cartoon silly face and a basic Bigfoot face are three of the current options planned. Additional options are to include: Solar powered eyes that will glow at night, a motion detector with alarm incase it tries to walk, an external motion detector with customizable recording. This recording feature will allow the owner to have the monster say anything when someone approaches it: from a loud growl, to a friendly “Eat at Joes” dependent upon its usages. The statue comes either fully assembled, or in kit form. Starting off with a picture of me hunched over, I transformed the basic shape to a wood model. 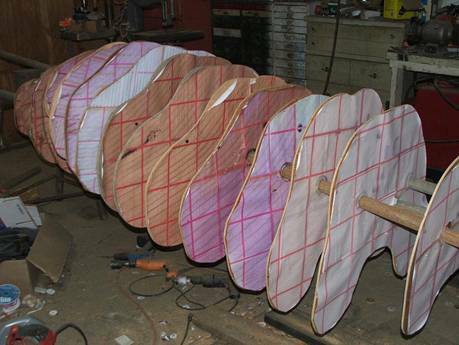 I then roughly carved the shape, then a second model about 15 inches tall. I then sausage cut the model, then scanned the pieces into a computer. 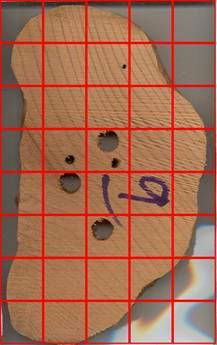 I then enlarged the pieces on the computer and transformed the pictures to full sized plywood stations, linked together with a pipe for indexing the shapes. I used 1 by 1 wood pieces to keep the plywood stations equal spaced. The pipes also help in rotating the plug while doing the work. From there, I used aluminum screening to stretch between the plywood stations, held in place with staples. Next, I fiber glassed a coat over the whole thing. The coat was a combination of mat and roven-woven to create a strong plug. 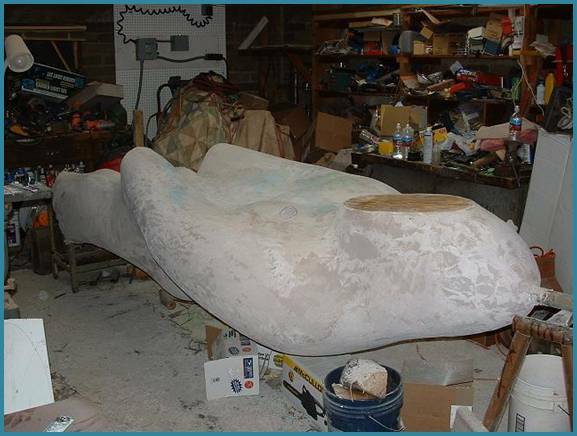 Once the fiberglass had cured, a layer of light weight body filler gave the final look or shape of the Roadside Monster. 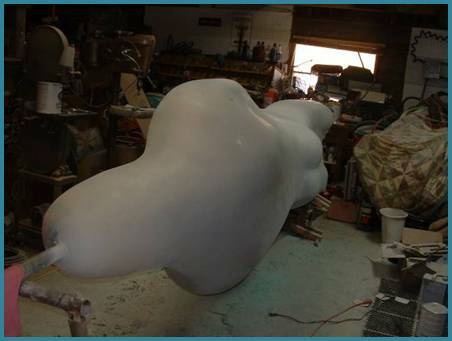 As a final smoothing of the plug, a coat of PCL 901 Grey Polyprimer will be sprayed over the complete plug. The plug will be now done. Mark Alfrey, the world renown special effects artist was commissioned to do the face. 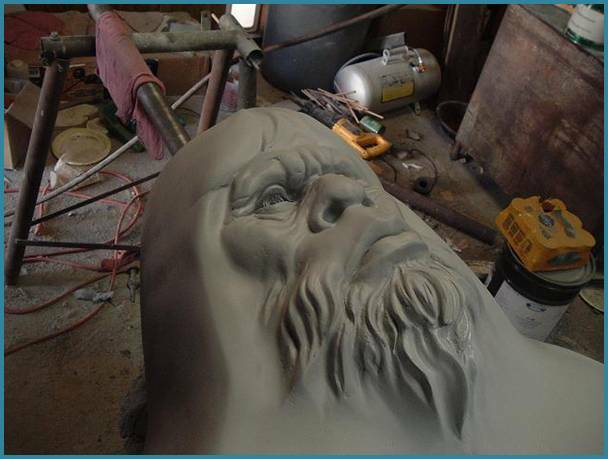 The preliminary face (serious bigfoot) is below. I asked Mark to give me a cross between Harry and The Hendersons, and the Patterson Bigfoot. I am extremely happy with what Mark has done. For more information on Mark Alfrey, please see his other outstanding works at www.markalfrey.com. 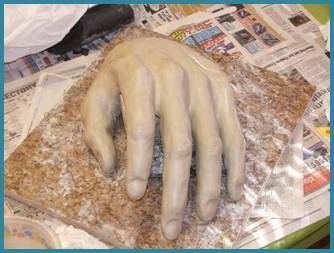 I have also started on the hands (above). I have a wet clay start, we’ll have to see where they end up. Not happy with this one, too much like my hand… so I’m starting over on the hands.. These guys are a little over 11 feet tall, probably about 250 lbs. (still need to weigh one.) I made a 4 foot by 8 foot stand for them that weighs about 150 lbs. 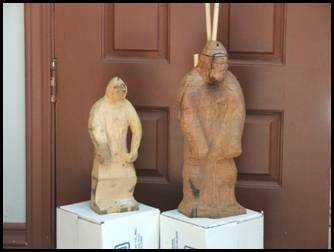 The statues are anchored to the stand with 5/8th inch L bolts, so the new owners could permanently anchor them if they wanted. I spelled it out to avoid the spam machines.